"We were surprised to learn that planets only a few times bigger than Earth are covered by a lot of gas," said Lithwick, an assistant professor of physics and astronomy at Northwestern's Weinberg College of Arts and Sciences. Gaseous planet challenges assumption that Earth-mass planets should be rocky. Astronomers have discovered an extrasolar planet with the same mass as Earth, but the resemblance ends there. Not only is the planet too warm for liquid water to exist on its surface, but it also has a radius 60% larger than Earth, suggesting a vast, puffy atmosphere of hydrogen and helium. “You’ve got a very small planet that is probably not rocky at all, and that’s frightening,” says Jacob Bean, an astrophysicist at the University of Chicago in Illinois. What is scary, he says, is how the finding challenges the assumption that an Earth-mass exoplanet would have an Earth-like composition. With its thick atmosphere, the exoplanet is more like a scaled-down Neptune or Uranus, he notes. I would think that a strong test for the EU theory is if we're able to track the motions of planets around other stars. If they all appeared to be "stable" like ours currently is, then I'd have a doubt for the EU. That capability isn't too many years off, now, I would guess. I'm pretty sure it's not possible with current techniques and technology. Wow that'd be so cool to watch, eh? The Kepler spacecraft used photometric observations to detect most of the extra-solar planets we know about. Is there an EU explanation for the photometry that would offer an alternative to the extra-solar planet theory? Might there not be any extra-solar planets? I'm having a hard time understanding how so many planetary systems (stable or not!) can just so happen to have planets the transit their sun along our line of sight. CosmicLettuce wrote: If they all appeared to be "stable" like ours currently is, then I'd have a doubt for the EU. CosmicLettuce wrote: The Kepler spacecraft used photometric observations to detect most of the extra-solar planets we know about. Is there an EU explanation for the photometry that would offer an alternative to the extra-solar planet theory? Might there not be any extra-solar planets? I'm having a hard time understanding how so many planetary systems (stable or not!) can just so happen to have planets the transit their sun along our line of sight. 76 confirmed systems out of 150,000 observed doesn't sound high to me. CosmicLettuce wrote: I'm pretty sure it's not possible with current techniques and technology. In the EU model the stars may not be as stable as assumed under the mainstream model. See the Hertzsprung-Russell diagram section of Donald Scott's book THE ELECTRIC SKY, or James P. Hogan's article "The Cosmic Power Grid." Hogan's sci-fi novel CRADLE OF SATURN, while hardly strict EU, will introduce many of the associated subjects (ancient scripts as historical accounts, Earth as a one-time satellite of Saturn, the electric scarring of planets and moons, etc.). Perhaps I'm just too new to the EU theory, but my understanding is that the EU predicts that planetary systems would be very dynamic ("unstable") rather than "stable" like ours is. So seeing regular photometric fluctuations would be unusual. Is that incorrect? I agree that looking at it that way, that is a small number. However, I have to correct you and state that Kepler has discovered 134 exoplanets (yeah, that's still a small number) with another 3277 possible detections and I'm pretty sure that the pace wasn't slowing down when Kepler had it's little accident. Assuming 3277 positive detections, that's at 2% which IMO is quite significant and strange. In total, there are 1076 extrasolar planets "known". I'd guess that the percentage of extrasolar planets we can photometrically detect in the sky would be roughly equal to the percentage of eclipsing binary stars we can detect. Does anyone know that number? This is all assuming stable orbits. If the EU theory is correct and things are more dynamic, then the percentage might actually be higher! I dunno -- sounds like a fun little calculation to make. I'm not close to being convinced that what Kepler is seeing is actually transiting planets. Could be sunspots, could be something else totally new. No one knows for sure -- yet. Kepler has it easier than ground-based observations for sure, but still millimagnitude and micromagnitude measurements are very tough. That being said, I do find it encouraging to learn that there may indeed be planets orbiting stars in erratic ways. A positive case for the EU. I'm looking forward to a time when we can watch them directly. If anything, mainstream is acknowledging the existence of "free floaters." Planets traveling through interstellar space alone, without an association to a "parent" star. These free floaters are subject to capture if they come under the influence, gravitational or electrical, of a passing sun. Astronomers know that there are many so-called "free floating planets" in space - planets that have been tossed out of their original solar system by a random gravitational encounter with another planet. Some of these orphan planets have recently been detected. Is it possible that changes in Birkeland currents cause changes in planets' and stars' orbits? ElecGeekMom wrote: Is it possible that changes in Birkeland currents cause changes in planets' and stars' orbits? Definitely, since EM relation changes. "A mega-Earth is a lot of solids concentrated in the same place without any gas. That is a problem because our understanding for how planets form requires the solids to get together in an environment where almost 99 percent of the mass ... is hydrogen and helium," Sasselov told reporters at a press conference. How many more mysteries do they need to understand that their cosmological and planetary formation theories are not based in reality? “It will be interesting to know if any additional objects in the Gliese 832 system follow this familiar Solar System configuration, but this architecture remains rare among the known exoplanet systems,” the scientists said. Gliese 832 is a double star. Here you go again, obsessed with double stars! How does that link in your post "prove" that Gliese 832 is a double star? Gliese 832 is, nowhere that I could find, declared to be part of a multiple star system. Gliese 832 is a small star in our stellar neighborhood, it is visible in binoculars. It seems that if there was a stellar companion then it would be certainly be detectable by modern instrumentation. Why is it not mentioned anywhere? Where is the companion star hiding? 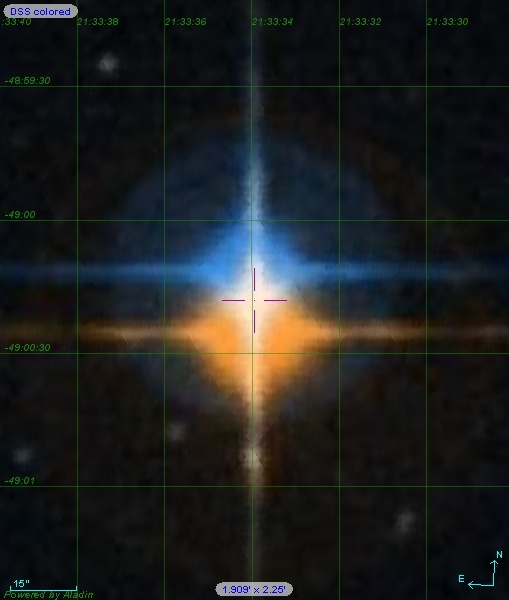 Multiple and double star systems are common, but there is such a thing as a lone star. I have no problem with double stars and their associated planetary systems. I would think that they are quite common. However, you seem to see stellar companions where no one else does? How does that work? Could you clarify? Sky atlas images that are provided are easily explained with double star presence. What other explanation for the specific configurations of objects would you suggest? For the relevance, please, compare the respective coordinates from the Wiki page and object from the sky atlas on the picture. Aladin sky atlas is free and easy to use, so you can check the source. There you might find more details like original photo ( not colored ) and the time of its making. It looks like, the older instrumentation were better than the modern in seeing the Near Infrared objects. Stars in close proximity on a star map could just be lined up. You need more evidence than that. Why does Astronomy not know that Gliese 832 is a double star? They are pretty good at detecting things like that, what technique do you know that they don't? Optical Double. This is not a binary star at all. An optical double is just two stars that appear next to each other on the sky.